Whirlpool baths were only part of the solution for Peter the goldendoodle. 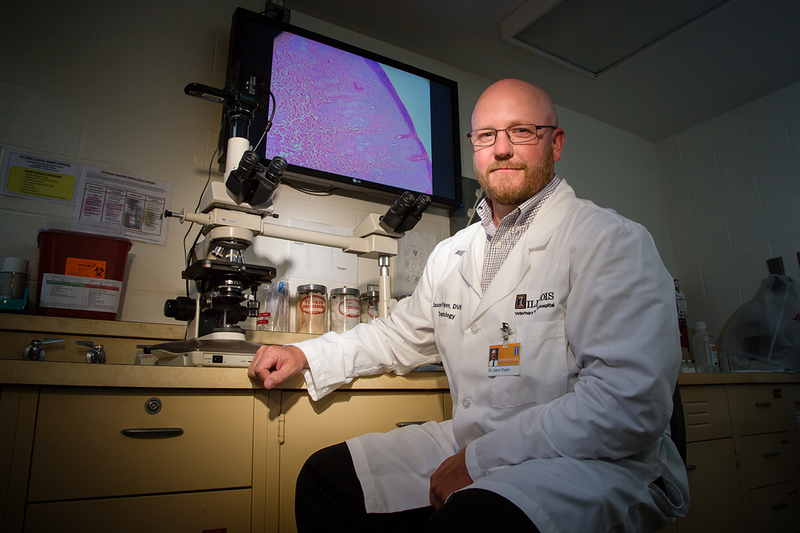 Veterinary clinical medicine professor Dr. Jason Pieper, a veterinary dermatologist, treats skin problems of dogs, cats and other critters. CHAMPAIGN, Ill. — As a veterinary dermatologist, I see my share of unusual cases. I’ve treated a cheetah with dental disease, an itchy wallaroo, an alpaca with allergies and an alligator snapping turtle with an obstructed throat. But infections in dogs, cats and other critters can be among the most difficult conditions to treat. Today, I'm looking at the gradually healing scabs and scars on the back of a goldendoodle named Peter. The scabs are impressive, but the fur is growing back and he’s in much better shape than he was a few weeks ago. Peter’s troubles started when another dog bit him and the wound got infected. The emergency service here treated him with an antibiotic and the infection went away. Several months later, Peter had another incident – another wound to his back. The team gave him antibiotics again. But in a week or two, the wound started spreading and ulcerating. That’s when they called me in. We took tissue samples and looked at them through a microscope. The pathologist saw a lot of white blood cells around the blood vessels, a sign of inflammation. The dog had developed a vasculitis, where the small blood vessels became so inflamed that there was no blood flow there. And because of that, the skin and underlying tissue started dying. Peter had experienced an adverse reaction to the antibiotic. We immediately gave him immune-suppressing drugs to stop the drug reaction. But we also needed to increase blood flow to the infected area and treat the infection. We didn’t want to give Peter more drugs, so we decided to use topical treatments, including a whirlpool bath. 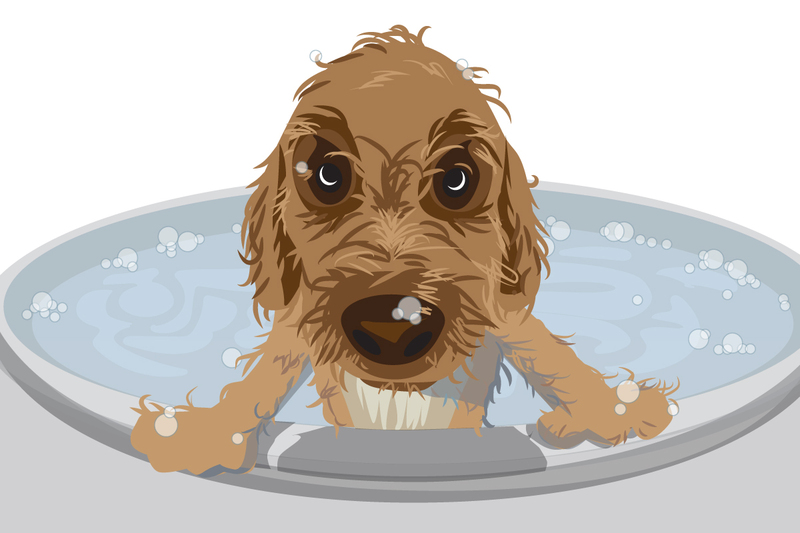 The tub we use isn’t very fancy; it looks like a very tall horse trough – tall enough for a goldendoodle – with a motor that circulates the water. When we first put him in the bath, Peter’s back seemed to get worse very quickly. All of the dead skin and tissue started sloughing off. We bathed the dog three times a week, chlorinating the water to treat the infection. We also used silver sulfadiazine cream, which has antibacterial properties. The silver in the cream breaks down bacterial biofilms and cell walls, allowing other medications to penetrate the area. It also has a calming and soothing effect, which is one of the reasons it is used to treat really bad burns. We put a thin coat of the cream on the dog and used T-shirts to keep him from licking at the area. The owner had to change the shirts several times a day. Peter’s healing back reminds me why I love what I do. There’s nothing better than seeing animals respond and get well. A lot of people hate the skin; when they see a disgusting infection, they say, “Ugh,” whereas I say, “Yes!” I get very excited about it because I know what can be done to relieve that animal’s suffering. 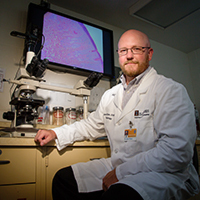 Jason Pieper is a veterinary dermatologist and professor of veterinary clinical medicine at the U. of I. College of Veterinary Medicine.